The extensive audio soundset demonstrates the Bash-man's versatility and lifelong knowledge of ancient and modern rhythms alike. Johnson's decades-in-the-making stash of rare instruments appears here in a head-spinning array of Jungle-primed Loops, precise One Shots, and original effects. More than 1 gig of grooves await any style—including DnB, Dubstep, Pop, Hip Hop and Underground Electronic Dance Muisc. Precise and powerful, the Bitz & Piecez series was recorded by NYC's famed Roc Isaacs, who put to tape such names as Run DMC, Mary J. Blige, and Ziggy Marley. Isaacs rendered the cream of Bashiri's collection in glistening 24-bit, 44.1-kHz samples, formatted in Apple Loops, Wav, and Rex.2 for total versatility, ready for use with New Battery 4, Maschine, and Logic. "Bashiri has created another blockbuster toolkit for composers and performers. Bitz & Piecez Vol. 2 is an A+ collection of rhythm loops, phrases, and sound effects that covers a wide range of musical styles and applications, both acoustic and electronic. From film scoring and record production to content creation and live performance, this library delivers." 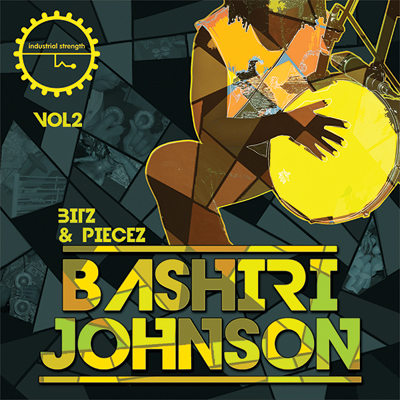 "Master Percussionist Bashiri Johnson Launches “Bitz & Piecez” Vol. 2 – Rare Instruments & Loops"